companionable level (especially Yoko Ono). 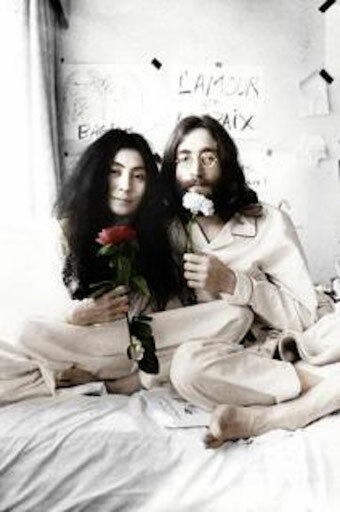 Yoko Ono is a bit more detached and independent than John Lennon. Sharing ideas and common interests is important to both of you in any friendship. not tolerate being tied down. between you, but if your philosophies differ radically you are unlikely to be such good buddies. and out of each other's lives at unexpected times. openly and you help each other see the brighter, more beautiful side of life. element of unpredictability and spontaneity as well and you enjoy improvising new ideas and playing together. similarity in tastes and enjoyment of leisure activities and pleasures. communications is very strong. You must make sincere efforts to listen receptively and sympathetically! design, and develop ideas jointly in a very successful manner. religion. You kindle each other's imagination and ideals. You work together well in the arts and in humanitarian areas. You have a strong intuitive and psychic rapport and often understand each other without need for words. investments are likely to arise. financially or emotionally, but you tend to become too formal and rather joyless if you spend too much time together. practicality is often a help to Yoko Ono.